ITSD is a team of about 1,000 IT professionals with diverse backgrounds and skill sets. These state employees are dedicated to providing Missouri's state agencies with the systems, networks and technical support they need in order to provide services to Missouri's citizens, businesses and other government entities. Geographic Information Systems (GIS) - The Office of Geospatial Information (OGI) provides coordination, guidance, and leadership, and plans the implementation of Missouri's geospatial information technology. The office identifies, coordinates, guides, and supports strategic investments in geospatial technology, data, and service systems to ensure effective implementation and use of geospatial information. 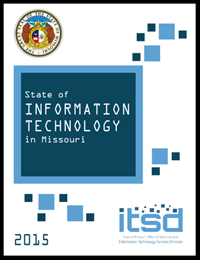 For more information, download the State of IT Report. ITSD provides Internet and telecommunications services to all state agencies. The judicial and legislative branches of government maintain their own IT units. State agencies that are not currently supported by ITSD, but desire consulting services from ITSD or wish to obtain direct support should contact the CIO.